These days I am trying to better document the process behind the making of a lot of my pieces. Not only is it interesting to see the progression from uncarved leaf to framed piece, I want to be able to lay some helpful groundwork to artists who are interested in trying this challenging art form for themselves. 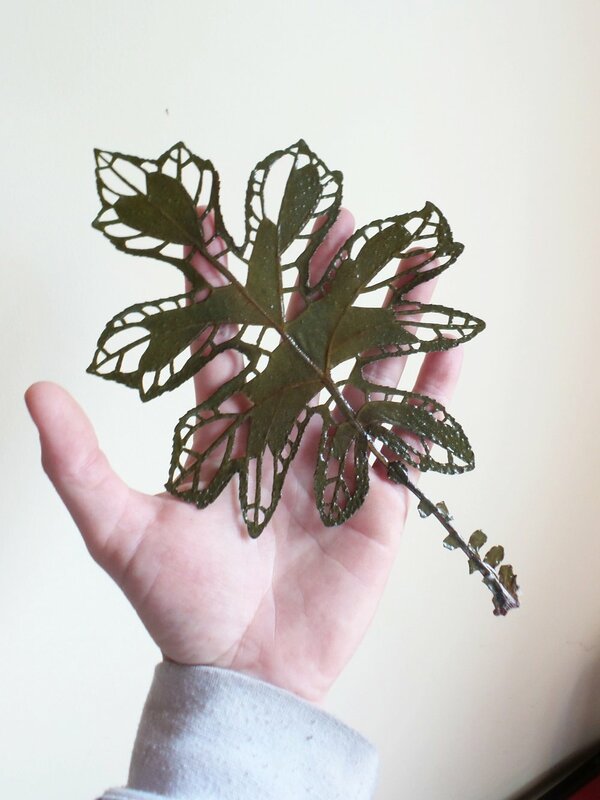 Seeing the process unfold also gives people a heightened appreciation for the effort that goes into making leaf art. This particular piece started off following the same procedure I've used for abstract pieces in the past, simply letting the vein patterns in the leaf take me away on a journey led by instinct. The leaf is made up of main, secondary and tertiary (and even quaternary) veins along with the spaces between them. Depending on which of these groups one focuses on, the finished leaf will look quite a bit different from its neighbor of the same type. 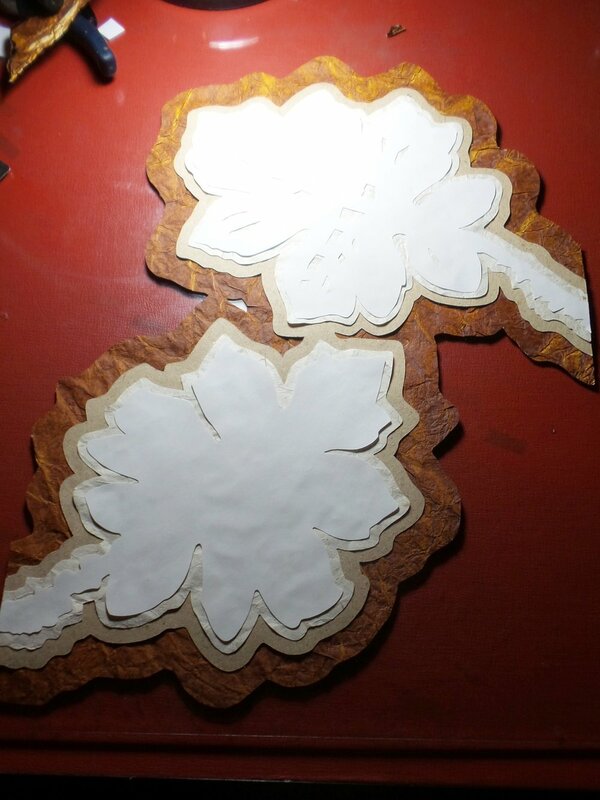 I began this project by playing with the presentation of two leaves with interesting outer shapes. (Click on each picture to enlarge). After carving the leaves, I finished them with the usual coat of two part epoxy and, the following day, a spray coat of UV protector. This accomplished, I sat studying the leaves and considering how I wanted to incorporate them into an arrangement. That is when things started to get weird, and take a very interesting and ambitious turn. My eye kept going to the outside edges of the leaves and admiring their graceful curves. I found myself wanting to trace those lines again and again...and suddenly I got a flash of inspiration! Why not do exactly that, with ever increasing sizes and gradients of color? I remembered having doodled in school doing this exact thing with some random shape and different colors of markers (usually when I was supposed to be paying attention to the curriculum). Being that the leaves were a dark green, I decided to go from white and progress down to black as the ultimate background. 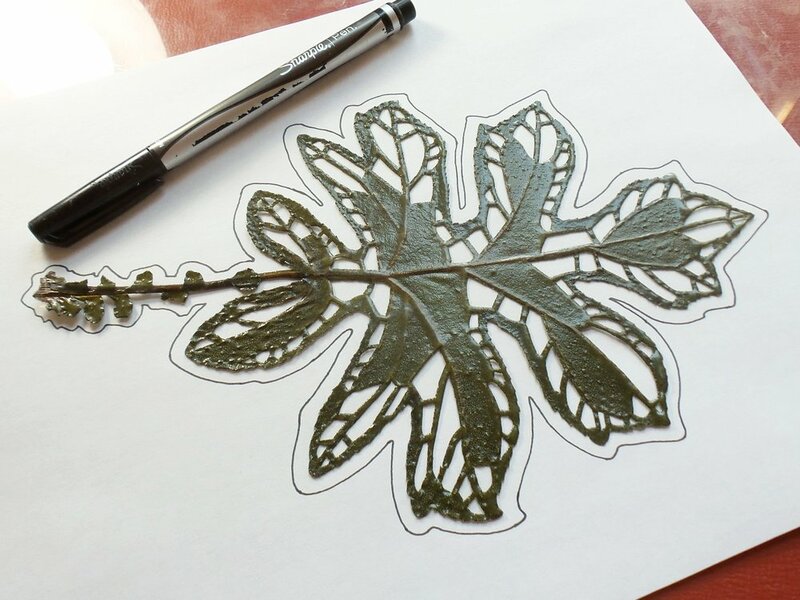 I positioned the leaves on the black background, deciding on the composition, and started with tracing and carving the white paper. From there it was a matter of continuing on with the layering, using progressively darker backgrounds with the handmade paper I had on hand. I gleefully ignored the pragmatic voice in the back of my head that reminded me I had a very limited supply for the amount of creating I was doing at the time--I was onto something here, something totally new and exciting. As I progressed, I used carpet tape to adhere the layers. Some would say using carpet tape is overkill, but in my experience many double sided craft tapes just don't have the staying power that carpet tape does. Finally, I was ready to set the leaves. 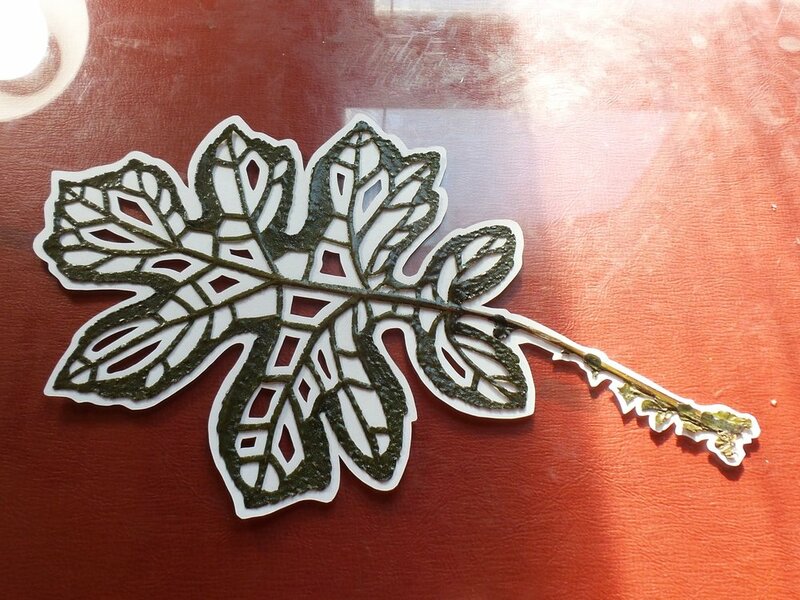 Once the backing on the tape is removed and the leaf is descending towards the paper, it must be set just right the first time as the tape sticks immediately. With a combination of luck and the utmost care, I managed to avoid any mishaps. I took a step back, and felt a deep satisfaction with the culmination of what had been over a 10 hour workday on the background alone. The frame I had selected to use was a size bigger than my background and I had originally planned on a plain white border. However, my perception had been changed by the last 10 hours. I had plenty of scrap pieces of light colored paper in a variety of interesting textures and variations. So I decided to remain in keeping with the current theme and layered them around the edges before mounting the piece on top. The frame had originally been brown and I painted it matte black. As I sat there, exploring this new piece with my eyes and getting to know it, I found myself thinking of space and time. The piece appears to emerge from a deep velvety blackness glittering with faraway stars, its bold framework setting fire to the imagination. Try as I might, I couldn't capture the essence of this piece with a photograph. So I took a closeup video that I hope will give the viewer the same sense I felt when I examined it for the first time in its finished form.